Yes, you heard that right. I’m not going to forgo precious sleep to stay up all night making handmade costumes and party favors this Oct. 30. Now that I have a decade of parenting experience under my belt I’m dialing things back this year on the deadline Halloween crafting front. 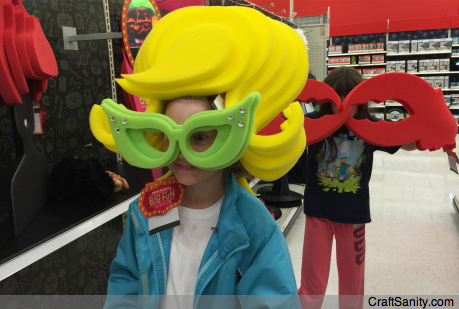 I even bought my kids costumes at Target this year. You can read my newspaper column about it in today’s edition of The Grand Rapids Press or online at MLive.com. While I don’t want to stay up all night making costumes the night before the party this year, I can’t let Halloween pass without making something. That would seem a little too weird for this extreme crafter. So instead of freaking out under the handmade holiday deadline pressure, I’m going to make a delicious treat with my kids and give it a spooky Halloween theme. She the recipe below. 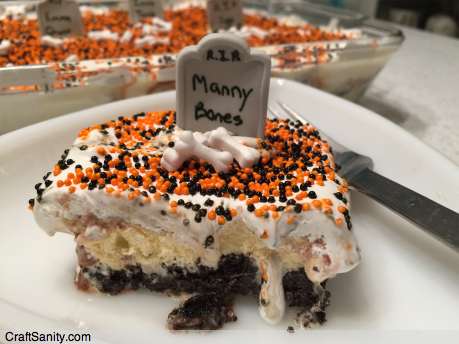 Optional: Orange and black sprinkles, tombstones or other Halloween themed cake decorations. 1. Smash up the whole package of Oreos and mix in melted butter. 2. Line the bottom of a 10”x13” glass pan with the crushed Oreo mixture. 3. Next, layer half-inch slices of vanilla ice cream. 4. Add a layer of chocolate syrup. 5. Spread a layer of Cool Whip across the top. 6. Add sprinkles and decorations, or simply top with a little more chocolate syrup. 7. Pop it in the freezer and chill until your ready to serve.